Next time I set fire to a small town, I must remember to contact the local pizza place to inquire about a bulk order. Last week, an explosion at a Chevron natural gas fracking operation in northwestern Pennsylvania resulted in a fire that lasted for days and may have cost one rig worker his life. Let’s not forget the environmental damage and other possibly hazardous longterm effects. 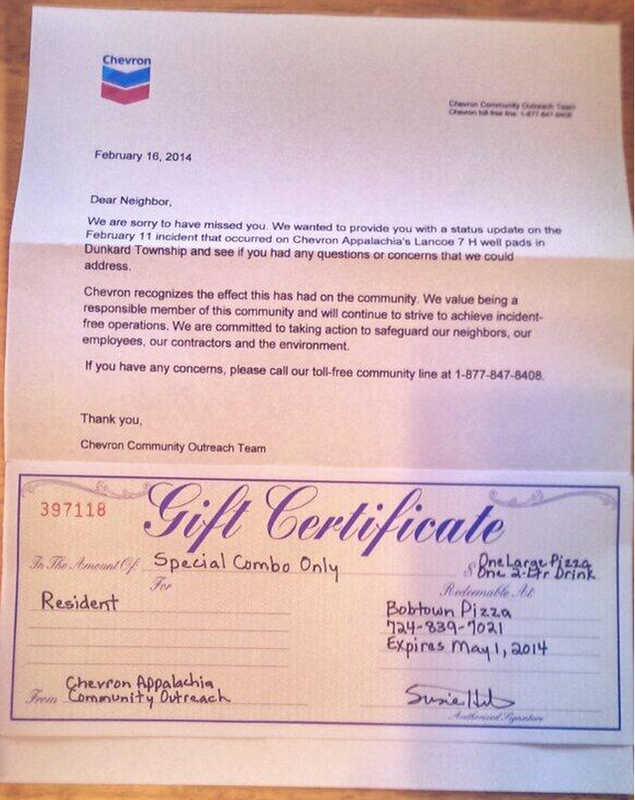 If you were a mammoth oil company like Chevron, how would you appease the local citizenry? By providing them pizza coupons, of course. We are sorry to have missed you. We wanted to provide you with a status update on the February 11 incident that occurred on Chevron’s Appalachia’s Lanoce 7 H well pads in Dunkard Township and see if you had any questions or concerns that we could address. If you have any questions, please call our toll free community line at 1-877-847-8408. And attached to the letter, a coupon for 1 large pizza and a 2-liter soda at a local pizza joint. That’s right. It’s not even for a dollar amount; just a pizza and soda. Want a cheesesteak? That’ll cost ya. Who do you think you’re dealing with, Exxon? Oddly enough, the offer of a pizza (and a soda, let’s not forget the soda!) in exchange for putting residents through a fiery ordeal strikes some as a bum deal. But not to worry, the folks at Chevron are taking this seriously. So quit your yapping, people of Bobtown. They could have just bought you some frozen pizzas and told you to roast them over the embers of your backyard.